The rogue detects fake infections and prevents legit softwares execution, displaying alert messages to scare users. If your PC is infected with Antivirus Suite use MBAM to remove the infection. If your PC is infected with AntiVirus use MBAM to remove the infection. I did a test on Virus Total Online Scanner with an inoffensive ASM code. The program just exit itself. No more, no less. Few years ago, the result on VT was: 3/33 with suspicious Virus Names. Today, the result is 10/42 for this Exit Program. This test was done with an unpacked binary. Using a packer increase the results: 27/42 with FSG and 25/41 with MEW. Various Trojan names were listed such as: Vundo, Trojan-Downloader, Backdoor/RBot and so on. With packed versions, some AV are detecting the file because of an heuristic routine: Trojan.Generic, Win32.Suspicious, Mal/EncPk-BA, Cryp_MEW-11. Take care with Antivirus Results and learn to decode Trojan Names. PS: I've edited the post, writing the conclusion in bold. Some people misinterpret this post: this is just a fun test, not an attack against AV vendors. If your PC is infected with Security Guard use MBAM to remove the infection. User Protection is a fake security application. This rogue prevents legit softwares execution, displays fake alerts and warning messages. User Protection also detects non existent infections to scare users. It is from the CoreGuard family (Dr. Guard, Paladin Antivirus copycat). If your PC is infected with User Protection use MBAM to remove the infection or follow Bleeping Computer's removal guide. WARNING WINDOWS SECURITY CENTER ! DANGEROUS TROJANS, KEYLOGGERS AND SPYWARES DETECTED IN YOUR COMPUTER !!! Entering ANY serial with more than 12 characters will remove the alert. If your PC is infected with Security Tool Ransomware use MBAM to remove the infection. Antivirus 7 is a new rogue. It replaces Antivir 2010. Like any fake Antivirus software, this rogue cannot removes or detects any malware. 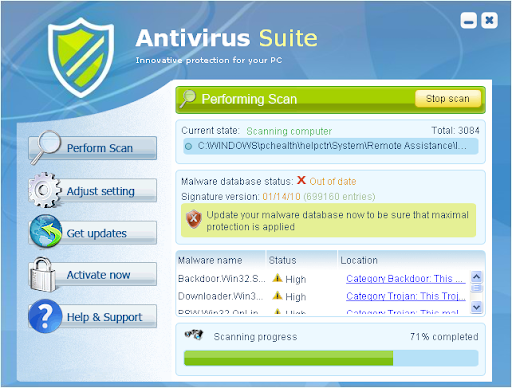 Antivirus 7 detects fake infections on a clean system to scare users. It also installs a BHO to display error messages in Internet Explorer. 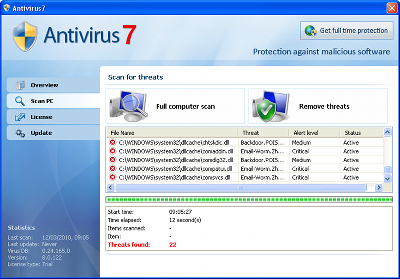 If your PC is infected with Antivirus 7 use MBAM to remove the infection or follow Bleeping Computer's removal guide. Smart Security (SmartSecurity, Smart-Security) is a new fake Antivirus. 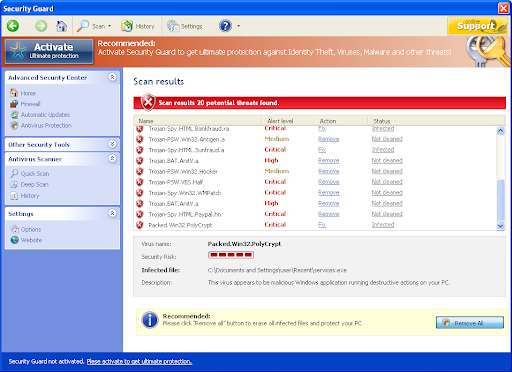 It replaces Security Tool (Total security 2009 family). Like the previous versions, registering the software won't help for updates. This tool is fake, during the download animation, there is no network activity. No files have been created when it says the tool is now Updated. The notable difference is: when registered, Smart Security does not detect malwares anymore (no cleaning required). If your PC is infected with Smart Security use MBAM to remove the infection. 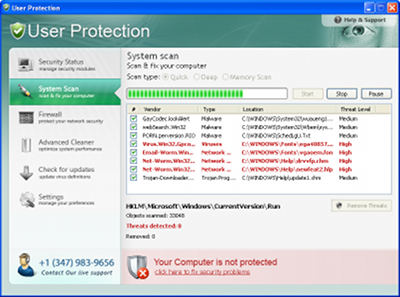 CleanUp Antivirus comes from fake online scanners. 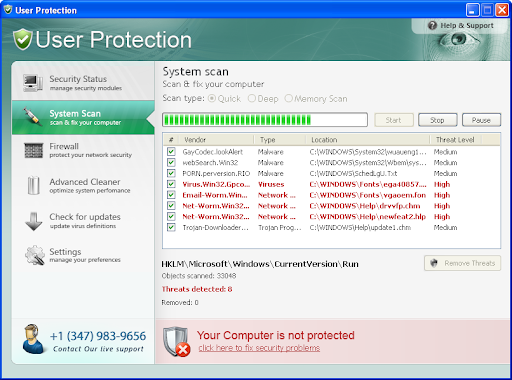 If your PC is infected with CleanUp Antivirus use MBAM to remove the infection. Antivir et MBAM détectent des logiciels de GibMedia comme étant ADSPY/Gibmed.A ou Adware.Gibmedia. GibMedia est une société toulonnaise qui offre des services payants comme des résultats d'examens, la météo, l'annuaire (...) Pour accéder à ces services, il suffit d'installer leur logiciel qui contient un composant minitel (édité par Synertel). Une fois le logiciel installé, on accède aux services payants. Il n'y a pas de vérification (âge ou contrat). La facturation est immédiate. 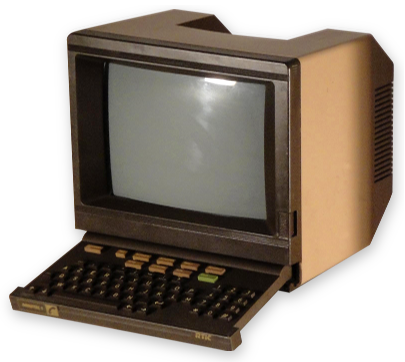 C'est le fournisseur Internet qui surtaxe la facture de la connexion Internet par un service "Minitel". De nombreux utilisateurs sont surpris de voir apparaitre une ligne "Service Minitel" sur leur facture Internet. Certains d'entre eux n'ayant pas installé personnellement le logiciel de GibMedia. Ce manque de contrôle lors de l'installation, les services proposés qui existent gratuitement sur d'autres sites web (meteofrance.com, education.gouv.fr, pagesjaunes.fr ...) ont incités des éditeurs d'antivirus à classer ces produits comme étant Adware ou AdSpy. En cas d'infection GibMedia, suivez l'aide sur le site de Malekal tout en utilisant MBAM. Like any fake Antivirus software, this rogue cannot removes or detects any malware. If your PC is infected with Antivir use MBAM to remove the infection.